It pays to do a little research and learn about a destination before packing your guns and hitting the road. Rules and regulations about your guns or bows, hunting seasons, limits and where you can and cannot hunt vary from state to state, so it’s important never to assume that the way you do things in your state is the way it’s done everywhere. Make sure, Seniors, you’re prepared for your next great hunting adventure. Before heading out of town, check the Department of Natural Resources website for the state you are planning to hunt in. This is where you can find information about a state’s hunting seasons, limits and various regulations. You can also inquire about and, in most cases, purchase a license and apply for permits online through these sites. In addition, many of these websites also offer information on where to hunt and about various species that you can harvest in a state. Huntingnet.com and Eastmans.com are a couple forums you can often find great advice about places to hunt as well as general tips on how to bag your limit. Talk with experienced hunters who know the area you’re traveling to. OutDoorNews.com is an all-around hunting and fishing site that updates the latest hunting and fishing reports for all areas. Some outdoor apps can also be helpful. iSolunar Hunting & Fishing Times gives you the best time to catch game or fish anywhere in the world. The Primos or Predator Hunting Call apps are especially handy for bringing in some hard-to-catch game. Although specific guidelines vary, most states now require that hunters show proof that they have finished a hunter education course before they can apply for a license. 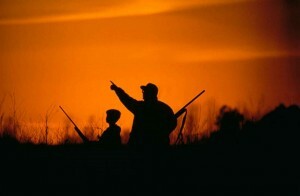 For example, if you are planning on hunting in Georgia, you will need to take a course. So it will be important try to book your hunter safety course for Georgia before heading out of state, if you haven’t taken one in the past. For specific guidelines on individual state hunting license requirements, check out the Texas Parks & Wildlife page, which has a state-by-state rundown of information. An experienced local guide could make the difference between bagging your limit and wasting your time and your money. According to Alaska’s Department of Fish and Game, most hunters who attempt to bag a moose without a guide and who stay on the state’s road system are unsuccessful. A guide can advise you on the hunting conditions as well as the terrain you’ll cover. Armed with this advice, you can bring or purchase clothing and footwear that will be appropriate for the territory you will be hunting in. A good guide can also help you dress and carry out meat from your hunting expedition. No matter how many times you head out on a hunting trip, there is always something you forgot. TheOutdoorLodge.com did the work for you and compiled checklists for camping, hiking, fishing, hunting, first aid and anything else you may need in the wild. Pre-pack first-aid kits, survival kits, cooking kits and camping kits to have available for all your trips. Print out these checklists and put them in a plastic paper cover in each of your packs to reference as you’re preparing for your next trip. John Hopkins: John is a stay-at-home dad and part-time handyman who loves the outdoors. He writes about his experiences in building, environmentalism and parenting.